4.Shoulder Width: Measure from left shoulder tip to right shoulder tip at the back. 5.Sleeve Length: Measure from shoulder tip to wrist. 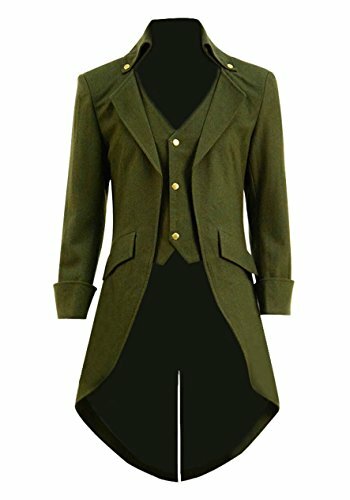 Men & Women Steampunk Gothic Victorian Tailcoat Costume. Good Choice for Halloween, Comic Con, Cosplay Shows, Party, Carnival, Photo Shoot, etc. 5 Material for Your Choice: "Polyester", "Faux-Leather(B07FFT2FLP)", "Woolen(B07FNHJXSX)", "Sequin(B07FMYD5KW)" and "Faux-Suede(B07FKPZ422)". In bracket is Product ID of each material costume from separate listing. If you are interested in a particular material, please search Product ID on Amazon. Please check pictures, color name and size carefully before purchase. Size: US Men/Women Size. Or please choose "Custom-made" then tell us (click "Contact Seller") which size you need: "Men Size", "Women Size" or "Custom Size". If you need "Custom Size", Please check "Product Description" below and tell us measurements. Search Product ID "B079CH8N9Y" to get children size for you kids. Shipping: 3 - 5 days by expedited shipping; 7 - 15 days by standard shipping. More High-Grade Halloween Costume: Just click "Very Last Shop". If you have any questions about this product by Very Last Shop, contact us by completing and submitting the form below. If you are looking for a specif part number, please include it with your message.